By 1984, Trevor Horn’s production work on Frankie Goes to Hollywood’s Welcome to the Pleasuredome had made him legendary. 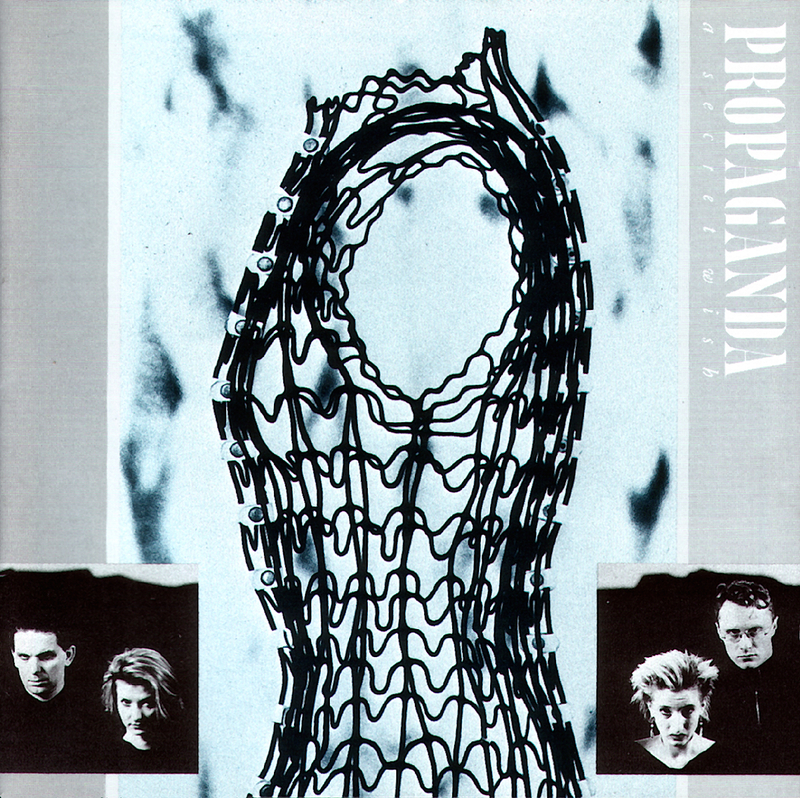 The obvious choice for his next project would have been its sequel, Liverpool, but instead he chose to work with five obscure Dusseldorf musicians; Ralf Dorper (keyboards), Andreas Thein (programming), Suzanne Freytag and Claudia Brücken (vocals) and Michael Mertens (percussion) – Propaganda. Yet A Secret Wish would not have been complete without the ‘conceptualisation’ of ex-New Musical Express scribe Paul Morley. Obsessed with French post-modern cultural theorists Roland Barthes and Jacques Derrida, Morley found this band an ideal vehicle for his sense of the dramatic. Dr Mabuse was the group’s first hit, a brilliant mix of Brücken’s icy vocals and Mertens’ epic synthesisers – complete with countless tempo changes, crashing crescendos and glides, plus jungle noises courtesy of a Fairlight CMI. Dorper’s appropriately melodramatic lyrics sign, seal and deliver it superbly; “The man without shadow, he promises you the world, tell him your dreams and fanatical needs… he’s buying them all – with cash”. P-Machinery explores that classic eighties zeitgeist – big brother. Mertens’ pounding, propulsive rhythms – programmed into early, pre-MIDI PPG sequencers – allied to big, fat, brassy synth stabs, form an epic musical backdrop for Brücken’s steely intonations, “Machines call out for followers, far out into the night.” Even Orwell himself would have enjoyed the lyric’s parting shot, “…another truth – installed by the machine”. Yet A Secret Wish is so much more than three stellar singles. Sorry for Laughing is a brilliantly reconstructed cover of Josef K’s classic 1980 Postcard release, Dream Within a Dream is Edgar Allan Poe set to a trancey synthesised backdrop and The Chase is a dark, melancholic run of descending piano cadences and spacey synthesiser pads. Strength to Dream – with its crashing power chords, strings and Fairlight storm sounds is a soundtrack looking for a film. Throughout, you can hear the voices and/or playing of Steve Howe (Yes), David Sylvian (Japan) and Glenn Gregory (Heaven 17). This record’s brilliance is its utter consistency; from conceptualisation, lyrics and music to the production and recording, it has an utterly cohesive, all-of-a-piece feel. It hailed from a time when electronic music technology was advancing apace, and the brave new world of digital synthesisers was becoming a reality. Its use of Linn drum machines, Fairlight CMI, DMX and DSX and Roland M5 synthesisers, gives it a sound very much of its time, while the Sony PCM1610 digital recorder (16-bit, 44.056kHz) lends it a chilly, greyish patina that suits the music perfectly. The band split a proper in 1985 and a middling remix album, Wishful Thinking, was released soon after. Brücken recorded a duo with Glenn Gregory When Your Heart Runs Out of Time, for Nicolas Roeg’s film, Insignificance, and went on to enjoy an artistically productive partnership with Thomas Lang as ACT. Indeed 1987’s Snobbery And Decay should regarded as this album’s real sequel, and not Mertens’ 1990 project, 1234 with American singer Betsi Miller and two ex-Simple Minds men, Derek Forbes and Brian McGee – which also used the name Propaganda. It is but a pale echo of the vast, audacious ambition of A Secret Wish.